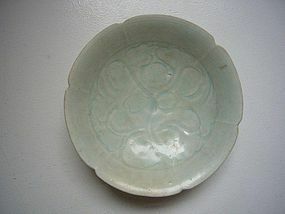 Song Qingbai Plate with Peony Decoration. Very nice lobed porcelain Qingbai plate with carved peony decoration. China, Song Dynasty (960-1279). Diameter 16 cm. Condition: glaze is locally crackled due to age, there is age wear to the glaze. No damage or repairs.